(Download) UPSC IAS Mains Exam Paper - 2017 : Commerce & Accountancy | IAS EXAM PORTAL - India's Largest Community for UPSC Exam Aspirants. Candidate has also attempt FIVE questions in all. Questions no. 1 and 5 are compulsory and out of the remaining, any THREE are to be attempted choosing at least ONE question from each section. The number of marks carried by a question /part is indicated against it. (b) Distinguish between Internal Reconstruction and External Reconstruction of Companies. (c) Define Responsibility Centre”. Explain its various types. (d) Write a note on 'Service Tax'. (e) "Verification of Advances is an important function of an auditor of a Bank", Explain. (i) In the six months ended 30.6.2014 Lokesh Lud. 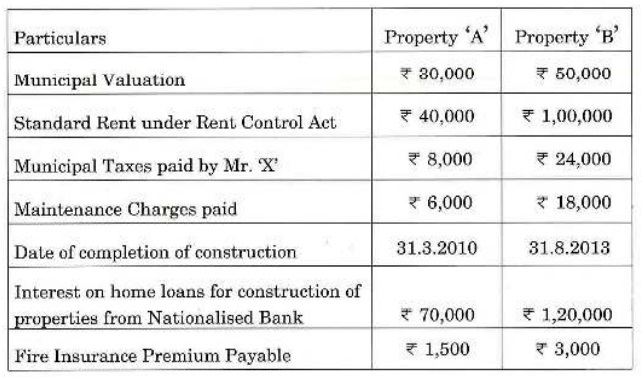 made a net profit of 60,000 after providing for depreciation at 10% per annum on fixed assets. (ii) Rakesh Ltd. during that period made a net profit of 1,45,000 after providing for depreciation at 10% per annum on the fixed assets. (iii) Both the companies had distributed dividends of 10% on 1.4.2014. 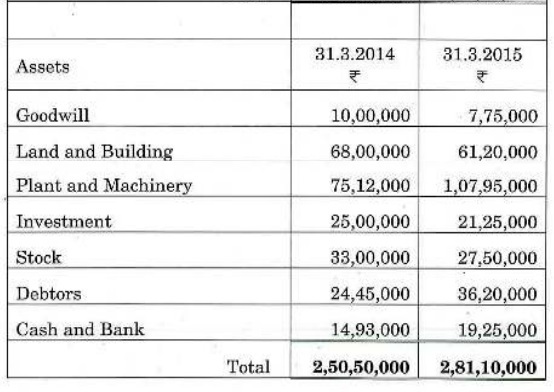 (iv) Goodwill of Lokesh Ltd. on the date of takeover was estimated at 25,000 and it was agreed that the stocks of Lokesh Ltd. would be appreciated by 15,000 on the date of takeover. (v) Rakesh Ltd. to issue shares to Lokesh Ltd. on the basis of the intrinsic value of the shares on the date of takcover. 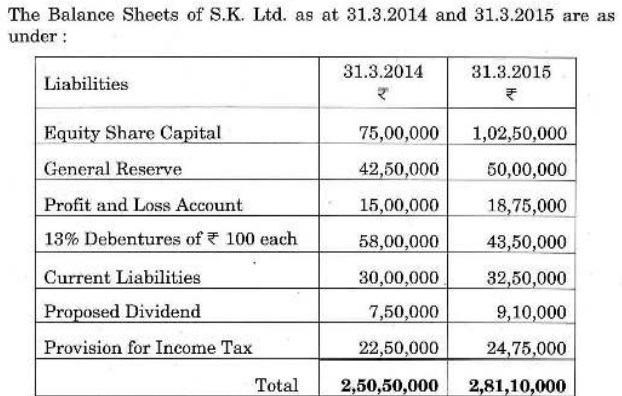 Prepare the Balance Sheet of Rakosh Ltd, after absorption. (b) How is Differential Cost Analysis helpful in decision-making ? (c) "Residential status has its effect on computation of taxable income under the Income Tax Act, 1961." Discuss. (b) Discuss the provisions of Indian Accounting Standards on Accounting for Depreciation. (ii) Mr. x was employed by ABC Ltd. on a monthly salary of 750,000 plus monthly travelling allowance of 10,000. (iii) He donated during the year * 1,50,000 to a charitable trust approved under Section 80G of the Income Tax Act, 1961. (iv) He spent 7,500 for his health check-up during the year. You are required to compute Total Taxable Income of Mr. 'X' for the Assessment Year 2017 - 18. Q4. (a) A bank has received an application from a customer for a loan. You have to investigate on behalf of the bank the accounts of the customer. Highlight those points you would like to concentrate upon. (b) Define 'Normal Wastage', 'Abnormal Wastage' and 'Abnormal Effectiveness'. State how these are treated in Process Costing. You are required to compute the income from capital gains for the Assessment Year 2017 - 18. Also suggest the actions, if any, that may be taken by Mr. 'A' to avoid tax on capital gains. (a) "Profit maximisation is the goal of Financial Management." Critically examine. (b) Discuss the Risk-Return Trade-off in financial decisions. (c) Distinguish between Money Market and Capital Market. (d) Discuss the various methods of deciding exchange ratio in merger of companies. (e) State the valuation formula put forward by James Walter. Also explain the logic behind it. (Cash balance to the maintained is 60,000, Calculate the Net Working Capital Requirements of the company. (b) Discuss the role of SEBI in regulating the Capital Market. (c) Define Capital Rationing. Explain the factors leading to Capital Rationing and also state the situations of Capital Rationing. (b) Explain the techniques used by the Credit Manager in monitoring the status and the composition of Accounts Receivables. (c) What is Commercial Paper ? Explain its significance and the pre-conditions for the issue of Commercial Paper. (i) During the financial year 2014 - 15, the company issued equity shares at par. (ii) Debentures were redeemed on 1.4.2014 at a premium of 10%. (iii) Some investments were sold at a profit of 75,000 and the profit was credited to General Reserve Account. (iv) During the year, an old machine costing 23,50,000 was sold for 6,25,000. Its written down value was 8,00,000. Depreciation is to be provided on plant and machinery at 20% on the opening balance. (vii) Provision for tax made during the year was 4,50,000. (b) Define 'Optimum Capital Structure. Discuss the major considerations in the Optimum Capital Structure planning of a firm. Q2. (a) "The critics of organizational theory are of the view that modern theory of organization is like an old wine in new bottle'.” Examine the statement. (b) Organizational environment decides the success or failure of an enterprise. Do you agree? Give arguments in support of your answer. (c) Virtual organization emphasizes vitality and growth of an organization. Elucidate. Q3. (a) The theories of motivation are not competitive to each other, their interrelationship needs an understanding for integrating them. Suggest steps for the same. (b) "Quality circles tend to show little or no effect on the productivity of an organization." Do you agree? Suggest a framework to make it more responsive and effective. (c) "Leadership vacuum works as double-edged sword.” What are the implications of this statement? Q4. (a) Explain the technique of management by objective. Give suggestions for making it more effective. (b) Explain the internal and external changes which must be taken into account by the management in framing its policies. (c) Line and staff functions in a modern organization are irrelevant. Do you agree? Comment. Q6. (a) "One thing is now universally accepted that in the long run the cost of not training is always more than the cost of training and the greater the training activity in an organization, the less the doubt about its utility." Comment. (b) "In an organization, we pay for jobs but not for men." Do you agree? How does job evaluation affect human relations in industry? (c) Suppose that your firm has gone outside of the organization to fill a position in middle management even though it has an announced policy of promotion from within. An employee has challenged this action on the basis of policy. What could be an appropriate reply? Q7. (a) "Indian trade union movement has failed to serve the purpose of its own formation." In the light of this statement, develop a suggestive framework to improve the functioning of trade unions in India. (c) "Mutual trust in an organization is the main key to collective bargaining." Comment. Q8. (a) "One of the instruments of industrial democracy is workers participation in management." Comment on this statement and offer suggestions to make workers participation more relevant and effective. (b) What is employee selection? Explain the different types of tests being used in the process of selection of employees. (c) Examine the influence of human resource outsourcing on business enterprises. Suggest suitable measures to make it more relevant and effective.